For Navajos, changes of mood and behavior are caused by winds streaming through the human mind. Only evil can occur when the dark wind gains control.... As a Navajo, Jim Chee was conditioned to expect a logical, orderly world. But in his new assignment with the tribal police in the troubled Navajo/Hopi borderlands nothing seemed to be logical. The body of a murdered man defied identification. A burglar refused to behave as burglars are supposed to behave. A vandal irrationally damaged the same windmill again and again. And the darkened aircraft which droned low over Chee's head in the predawn darkness flew illogically into sudden, violent death. 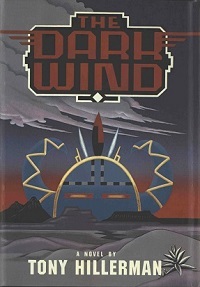 The dark wind draws Jim Chee and the reader into a world of Hopi sorcery, Navajo witchcraft, and the deadly question of what happened to the contents of a smuggler's plane. It leads to a tense climax in an old stone village on a night when no one is admitted but the Kachina spirits. Tony Hillerman once again uses his intimate familiarity with the Navajos and other Southwestern Indian cultures to tell a tale of suspense and illusion in which Jim Chee's knowledge of the ways of his desert-dwelling people and their Hopi neighbors unravels a mystery within a mystery.